Budget Unstructured Baseball Cap. Budget priced unstructured baseball cap made of 100% cotton. Features 6 Panels with sewn eyelets and adjustable fabric strap with two piece Velcro tab closure. Low profile and pre-curved visor. ..
Ball Marker Cap - Golf Tournament Gifts.. Camouflage Series Screen Print Outdoor Scenes Cap - Golf Tournament Gifts.. 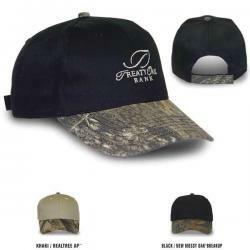 Fish Hook Camo Cap - Golf Tournament Gifts.. Medium profile six panel unstructured cap. Chino twill fabric. Contrast stitching on visor, eyelets, crown and fabric strap. Fabric strap with two piece hook & loop closure..
Low profile six panel unstructured cap. Heavy washed chino twill. Frayed applique & heavy accent stitching. Fabric strap with antique silver sliding buckle. .. The lightweight camouflage cap features an unstructured fit and hook and loop tab closure. ..